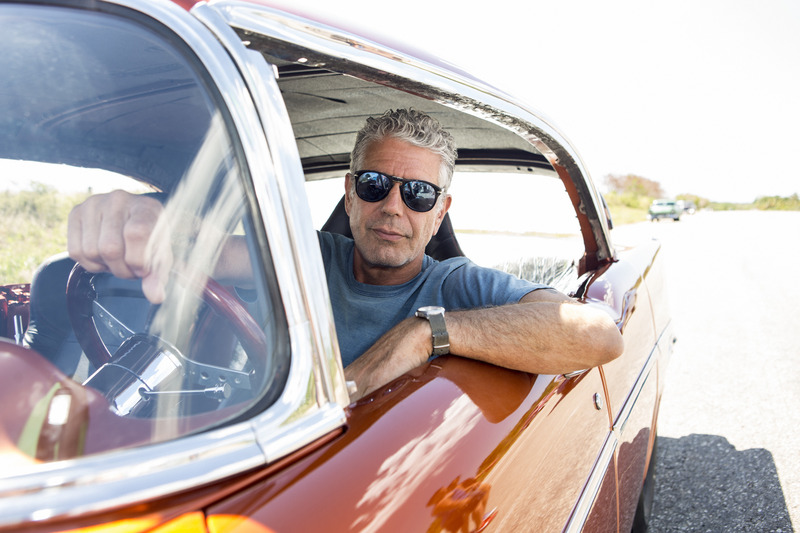 Season six of the top-rated Emmy and Peabody award-winning CNN Original Series Anthony Bourdain Parts Unknown begins on Sunday, Sept. 27 at 9pm ET/PT with the host’s tour of Cuba. The eight-episode season also features trips to Marseille, Okinawa, Ethiopia, California’s Bay Area, Borneo, Istanbul and Charleston, S.C. Airing just prior to the season premiere will be the latest edition of “Prime Cuts” at 8pm ET/PT that offers a look back at season five and a taste of things to come in the next eight episodes. Anthony Bourdain Parts Unknown follows the world-renowned chef and best-selling author as he travels the globe to uncover the little-known, off-the-road, and seemingly-familiar areas of the world in a celebration of their diverse foods and culture. Anthony Bourdain Parts Unknown is produced by Zero Point Zero Production with executive producers Chris Collins, Lydia Tenaglia, Sandra Zweig, and Anthony Bourdain. Cuba (airdate: September 27) In the season six premiere, Bourdain explores Cuba – just as the half-century U.S. embargo softens and economic and social progress loom – from its bustling capital city Havana, to the slower paced, music mecca Santiago. Sampled food includes pig’s head soup with plantains and pumpkin, flan in a beer can, and dogfish ceviche with pickled vegetables. The tour culminates with a dialogue-free tracking shot capturing the hopeful anxiety of its people, seemingly waiting for something to start. Marseille, France (airdate: October 4) Bourdain and his travel companion, chef Eric Ripert (Le Bernardin), visit France’s oldest city to experience its stew of cultures and cuisines, indulging in chef Gerald Passedat’s famous bouillabaisse, the classic pied et paquets, Algerian couscous and as much salumi and Corsican cheeses as they can handle. The pair also meet crime novelist Cedric Fabre, esteemed chef Georgiana Viou, and journalist Gilles Rof. Okinawa, Japan (airdate: October 11) The alluring island of Okinawa, which endures tragic memories from World War II battles, is explored by Bourdain from historical, political, cultural and culinary perspectives. The tour includes a bloodless bullfight over a bowl of Yakisoba, a retrospective meal of Tundabun with the city’s former governor, and a demonstration of open-hand karate experienced first-hand by Bourdain. Ethiopia (airdate: October 18) Acclaimed chef Marcus Samuelsson (Red Rooster, Aquavit) and his wife Maya take Bourdain on a personal tour of their native country to experience this nation beyond the headlines, first in Addis Adaba where they sample injera bread and beyaynetu platters, followed by drinking Turbo and eating Tibs with local skateboarding pioneers, listening to the traditional music of Azmari singers and legendary Ethiopian-jazz musician, Mahmoud Ahmed, a sampling Ethiopian coffee and a village feast with Maya’s family in the Gurage region. Bay Area (airdate: October 25) Bourdain visits the Bay Areas of San Francisco, Oakland and San Jose to take a personal journey – in martial arts training with Brazilian Jiu Jitsu instructor Kurt Osiander, and healing through food, featuring dinner at the original Trader Vic’s with author Sean Wilsey (Oh the Glory of it All) and at soul food restaurant Real Miss Ollie’s with Bobby Seale (Black Panthers founding member). Borneo (airdate: November 1) After a 10 year absence, Bourdain abides by his promise to return, dining on chicken rendang for a reunion meal at Aunty Aini’s, taking a boat ride to Kuching, traveling back to the longhouse at Entalau to attend the Gawai Rice festival, and acquiring a new hand-tapped tattoo, prefaced by a stop in “street food paradise” Kuala Lumpur for pork noodles and black pepper crab. Istanbul (airdate: November 8) The cliché East meets West rings true in Istanbul as Bourdain explores its confluence of food, culture and politics, featuring a Turkish breakfast with old friend Esra, an oil wrestling tournament, and lunch at an Armenian restaurant near the Golden Horn. Bourdain leaves the urban sprawl of Istanbul for Sedef Island and a meal with author and philosopher Gündüz Vassaf and celebrated Turkish actress Serra Yilmaz. Charleston, S.C. (airdate: November 15) For the season finale, Bourdain travels with “one of America’s most important chefs,” Sean Brock, to sample Charleston’s varied food offerings including traditional Gullah cuisine, and oyster pie and shrimp and grits at Brock’s restaurant Husk with actor and a Charleston resident, Bill Murray. Viewers can find updates, behind-the-scenes photos, and exclusive content on cnn.com/shows/anthony-bourdain-parts-unknown, by following the show’s Twitter account @partsunknownCNN, and accessing the CNN Parts Unknown Facebook page. The new season of Parts Unknown can be streamed live on CNNgo, and each new episode is available On Demand next day on both CNNgo and Cable VOD. CNNgo is available on desktop, iPad and via AppleTV. Leading up to the premiere of Season 6, fans can also binge on Season 5 On Demand on CNNgo and Cable VOD. Zero Point Zero Production, Inc. is a television, film and digital media company founded in 2003 by Executive Producers Chris Collins and Lydia Tenaglia, with partner and Managing Director Joe Caterini joining in 2009. Since its inception, the company has produced hundreds of hours of television in over 100 countries around the world, including the critically acclaimed, Emmy & Peabody Award winning series, Anthony Bourdain: Parts Unknown (CNN); the Emmy Award winning The Mind of a Chef (PBS) and Emmy nominated The Hunt with John Walsh (CNN). In 2009 Zero Point Zero began an expansion into other content platforms including interactive entertainment and publishing. In 2012 they released Pat LaFrieda’s Big App for Meat, an interactive encyclopedia chosen as Apple’s “App of the Week” and then named Apple’s “Best APPS of 2012”. In 2013 ZPZ acquired The Food Republic website, one of the launch properties in a new ZPZ-owned digital publishing venture. Other digital projects include content for such brands as Mastercard, Subaru, Microsoft/BING, TUMI, Lipton, Breville and Volpi Foods. ZPZ is currently in production on Anthony Bourdain: Parts Unknown season 7 (CNN); The Hunt with John Walsh season 3 (CNN); Bazillion Dollar Club (SyFy); Whistleblowers (Spike); City.Ballet season 2 (a co-production with Sarah Jessica Parker for AOL On Originals); The Mind of a Chef season 4 (PBS); the award winning series, MeatEaterwith Steven Rinella season 5 (Sportsman Channel); Apex Predator with Remi Warren season 1 (Sportsman Channel); I’ll Have WhatPhil’s Having (with Phil Rosenthal for PBS) and a documentary feature film on Jeremiah Tower (CNN Originals). ZPZ will also begin work on a 10 part, half-hour scripted comedy series in fall of 2015 (POPtv). Zero Point Zero’s hit shows, ANTHONY BOURDAIN: PARTS UNKNOWN (CNN) and THE HUNT WITH JOHN WALSH (CNN), ranked #1 overall across cable news in the time period among P2+ and P25-54. MEATEATER WITH STEVEN RINELLA is the #1 rated series on Sportsman Channel. The CNN Original Series group develops non-scripted programming for television via commissioned projects, acquisitions and in-house production. Amy Entelis, executive vice president of talent and content development, oversees CNN Original Series and CNN Films for CNN Worldwide. Vinnie Malhotra, senior vice president of development and acquisitions, works directly with filmmakers and producers to develop original projects for CNN Original Series and CNN Films.